Chick-fil-A advertises its Chicken Biscuits, made fresh daily for breakfast, in a hilarious new commercial. 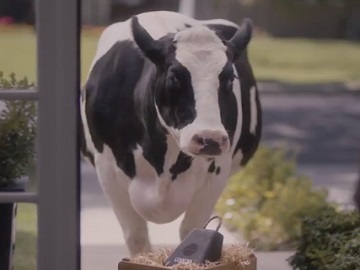 The 60-second spot opens with a cow delivering to a man a voice-enabled speaker dubbed “Cowza”, which it turns out is aimed at convincing him and his family to eat more chicken. Regular questions like “What’s the weather?” and “What’s the traffic like?” are answered in totally unexpected way: “perfect chicken eating weather” and “rerouting you to chicken”. Asked to order pizza the virtual assistant insists on ordering chicken until the man gives up on pizza and agrees to have chicken instead. One day, he decides to show off his “smart thing” to a neighbor, who gets to hear some of the information provided by the speaker. For instance, the capital of Indonesia is Jakarta, seven letters same as chicken. Chicken is the answer to many other questions, including “What’s the magic word?” and “What’s your favorite food?”. The neighbor also finds out that the thing was not bought online, but brought by a cow that is now wearing a poster featuring the text “Chikin iz tha smartest choice”. The Chick-fil-A Cows, created by Dallas ad agency The Richards Group, became advertising icons, appearing, over the years, in calendars, three-dimensional billboards, and TV commercials. They even had their own website and social media and helped Chick-fil-A expand and become the country’s 8th-largest U.S. restaurant chain. In 2016, The Richards Group, which had a 22-year relationship with the chicken chain, was dropped, the cow-centric campaign being taken over by McCann New York as the new lead agency. In addition, Chick-fil-A hired several agencies, including media agency Starcom, Erich&Kallman, DesignStudio, and Moxie, for other marketing that didn’t use its ubiquitious cows, in an attempt to reach to its target audience by approaching topics such as food, people and service.